English teachers are overwhelmed by initiatives, standards, and high-stakes assessments. However, the concerns we outline in this article cannot be pushed aside. Over the years, teachers of English have rallied against censorship, fought for the inclusion of diverse voices in the canon of literature, and recognized the power of out-of-school literacies. Now English teachers must embrace a new role: We must advocate for digital literacy, not just technology, in a way that reconceptualizes our discipline. We must dump the dittos, throw out the workbooks, and remix our teaching for a digital age. For help, we can look to a variety of scholars who study new media. Henry Jenkins and his colleagues, for instance, discuss the many opportunities present in our new “participatory culture” for ‘affiliation’ (membership in online communities) and ‘circulation’ (shaping the flow of media through new outlets such as blogging and podcasting) (Jenkins et al. 3). Howard Rheingold, in his recent book, Net Smart: How to Thrive Online, reminds us that we should be focused on our “intentions,” our ‘goals and priorities’ when it comes to our online lives (247). He also suggests that we reflect on our ‘attention’ as we participate digitally. He says, ‘attention training . . . involves asking yourself, at regular intervals, whether your current activity at any moment moves you closer to your goal or serves your higher priorities’ (247). Finally, Cathy N. Davidson suggests that we ‘rethink how we need to be organizing our institutions—our schools, our offices—to maximize the opportunities of our digital era’ (12). There are countless educators who blog, chat, tweet, text, pin, post, podcast, webcast, hangout, or otherwise engage in life online, both personally and professionally. We’d like to offer ideas for every English teacher, as a teacher of literacy, to work on an individual level to (1) develop his or her own digital literacy, (2) engage in a larger conversation about digital literacy in education, and (3) support students in developing digital literacy. Hicks, Troy and Kristen Hawley Turner. 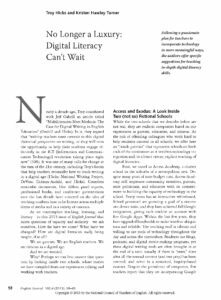 “No Longer a Luxury: Digital Literacy Can’t Wait.” English Journal 102:6 (2013) 58-65. Copyright ©2013 by the National Council of Teachers of English. Reprinted with permission.